Looking for a Wonderful Book to Teach Children about Prayer? Blog Looking for a Wonderful Book to Teach Children about Prayer? Prayer, God’s gift to His beloved children of all ages, provides an avenue for conversation with our Father. But we sometimes complicate what God intends to be simple and natural. How can we teach our children to pray? Best-selling author Nancy Guthrie and beloved illustrator Jenny Brake have teamed up to answer this question. 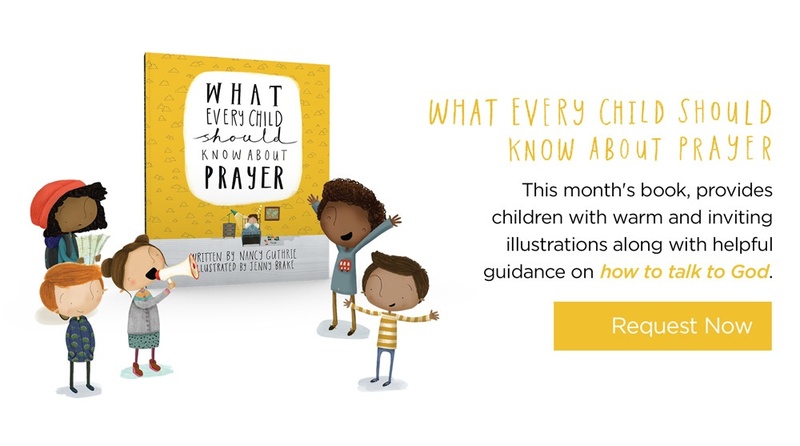 In What Every Child Should Know about Prayer, Guthrie and Brake incorporate child-friendly language and warm, inviting illustrations to explain what prayer is, how and why we should pray, and what we can pray about. What Every Child Should Know about Prayer covers topics such as how God wants us to talk to Him, how God’s people have always prayed, and how Jesus teaches us to pray. A Bible verse accompanies each topic, as well as a prayer for children to make their own. Request a copy of What Every Child Should Know about Prayer for your child or grandchild when you donate to Truth For Life today—and, buy a few extra copies to save as Christmas gifts! If you're a Truthpartner, simply ask for your copy as our way of saying thanks for your enabling support.